Glen Miller&comma; CTO of Vera Roasting Company. Photo by Matthew J. Mowry. 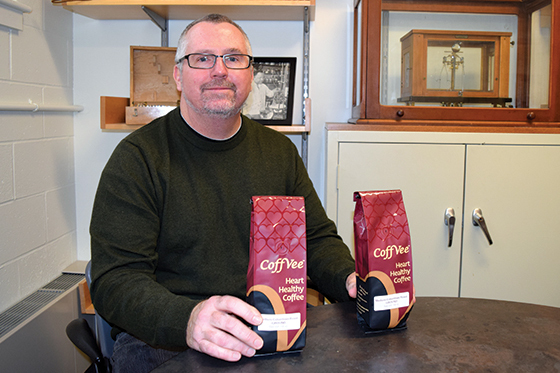 A professor of organic chemistry and chair of the chemistry department at the University of NH may not be a typical resume for a coffee company entrepreneur. But Glen Miller’s coffee product is anything but typical. Using his knowledge of organic compounds&comma; Miller figured out a way to infuse coffee with resveratrol&comma; a potent antioxidant typically found in red wine. The result is Vera Roasting Company&comma; which he launched two years ago and where he continues to serve as CTO. His goal&comma; he says&comma; was to develop an alternative to red wine so more people could reap the rewards of resveratrol. “Mother nature put resveratrol in the skin of grapes so&comma; when the plant needs it&comma; the plant can grab it to ward off diseases that would otherwise destroy the plant&comma;” Miller says. “When we incorporate it into our diet&comma; it does the same thing to ward off free radicals that cause disease&comma;” including reducing heart disease&comma; he says. Not everyone drinks red wine&comma; and Miller wanted to find a way to get resveratrol into more people’s diets. He first thought of bottled water&comma; but there were too many technical challenges as resveratrol is not water-soluble. And being water-soluble is important as that allows the body to absorb resveratrol&comma; he says. Miller then turned to coffee as he says 82 percent of adults in the United States drink coffee&comma; and the average coffee drinker consumes three cups a day. “I recognized that is the perfect vehicle to introduce a health benefit&comma;” he says. So Miller developed technology to infuse resveratrol into coffee beans using organic compounds that make it water-soluble. He adds the coffee does not taste like wine. “We extract the anti-oxidant from red wine and infuse it in our coffee beans with other natural compounds that allow the body to assimilate it&comma;” Miller explains&comma; adding a cup of his coffee has as much resveratrol as a glass of wine but without the alcohol or taste of wine. Once the chemist had the science figured out&comma; he worked with a master coffee roaster with 25 years experience to develop the roasts for Vera Roasting Company&comma; also conducting double blind taste tests to ensure the coffee would meet coffee drinkers discerning tastes. He knew marketing the coffee as heart healthy might not be enough to compete in the multi-billion-dollar coffee market. “We decided we wanted this to be a premium coffee product. 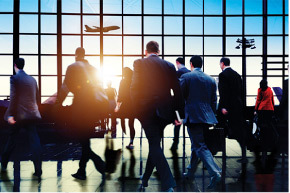 It has to be something people enjoy&comma;” Miller says. Vera Roasting developed three roasts for its “CoffVee” line: a medium roast&comma; a dark roast and a decaf roast. Beans are purchased from small farms in Columbia and Mexico&comma; according to Miller. And&comma; while Vera Roasting closed out 2017 with more than $100&comma;000 in sales&comma; Miller expects sales to hit $2 million by the end of 2019. The company hit some other important milestones in 2017&comma; including being awarded a U.S. patent&comma; expanding its customer base to all 50 states through a direct-to-consumer online sales strategy and distribution through 40 gourmet retailers&comma; launching a new website&comma; and opening a new production and fulfillment center in Newington. Vera Roasting also hired Mark Duggin&comma; the former CEO of Nike-Bauer&comma; as its CEO as well as a new director of production and fulfillment. As for the future of Miller’s private venture&comma; Vera Roasting Company is developing a line of infused teas that it expects to launch in Q1 2018&comma; and the company is developing plans to open a tasting room and retail shop this year.